I’ve been catching bass on a drop shot rig for years, and until a couple of years ago I always rigged it the same way. I tied a fluorocarbon leader to a braid main line and tied the hook somewhere down the leader. Then, I nose hooked my bait, or maybe hooded it in the middle, and went fishing. It worked. I caught my share but I was dissatisfied with my hooking percentage. I just felt like I could do better. And, at the same time, I was having trouble with line twist. Even my braid started giving me trouble after several hours of fishing. Because of those problems I started experimenting. I tried everything I could think of or imagine. And then one day, sure enough, I invented a better mouse trap. For openers, I now use a swivel between by braid and my fluorocarbon leader. It’s really tiny. I use the VMC Ball Bearing Swivel, not the Rolling Swivel. It’s too big. The Ball Bearing one will pass through my guides when I cast without a problem and it takes most of the twist out of my line. I say most because nothing is perfect. If you fish a rig all day, you’ll have some twist when you go back to the dock. I don’t think I have to tell you, though, that’s a heck of a lot better than what was happening. It’s manageable. This is the perfect drop shot hook. It has a point that’s 3 degrees off center so it’ll drive home with light tackle without getting into your bait and it has an adjustable keeper that holds any small plastic finesses bait in place. 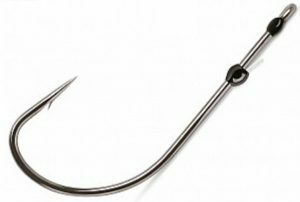 All I do is thread my bait — usually a Berkley Powerbait Maxscent Flat Worm or Hit Worm — on the shank with the bend, the barb and the point exposed and in a straight line above my lure. This gives me a clean hookset and it helps to hold the bait horizontal, away from the line. It looks more natural that way. I can’t say that you’ll catch more bass with my rig but I can say you’ll hook more of the ones you do catch. That’s a big part of the battle out there. My line choices are pretty simple and straightforward. I use 10-pound-test Berkley Fireline Ultra 8 Superline Crystal for my main line. I like Crystal (white) because it’s more visible than any other color. That gives me a better look at soft bites, the kind you don’t feel. 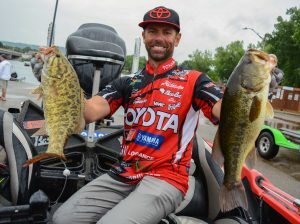 My leader is either 6 or 8-pound-test Berkley Trilene 100% Fluorocarbon. Try rigging a drop shot my way once or twice. You won’t be sorry. 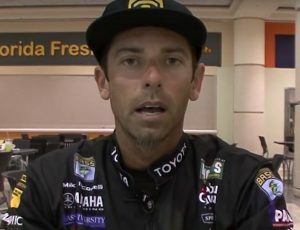 Learn More About Dropshots with Mike Iaconelli. DON’T MISS IT! 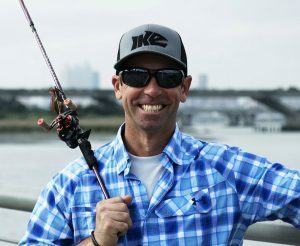 : Fish My City with Mike Iaconelli on Nat Geo Wild, starting Oct 12, 2018 at 8:00 pm! !